It has been a very long time since man counted on the moon’s position for any form of timekeeping. However, that doesn’t take anything away from the fact that, in the right hands (i.e. usually Swiss), a watch that charts the lunar cycle can be a thing of immense beauty. These days, most of horology’s top-tier have one or two moonphase examples in their portfolio, and they remain a popular choice among consumers for their aesthetics, if not for any intrinsic worth. Below we’ll explore three of our current favorite moonphase watches. The moonphase complication on the A. Lange & Söhne Lange 1 Moon Phase (Image: A. Lange & Söhne Lange 1 Moon Phase). 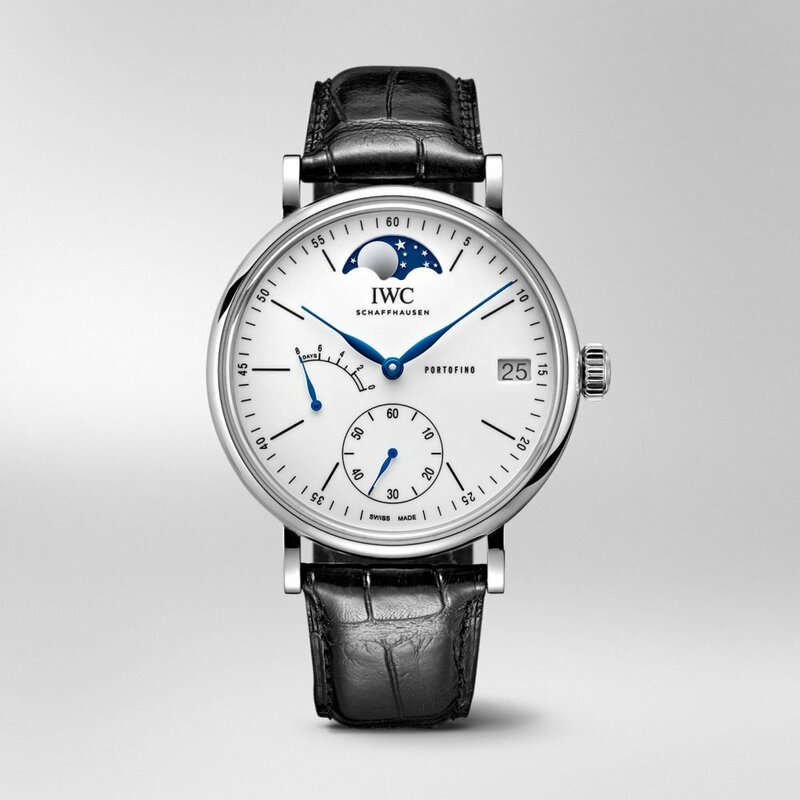 The IWC Portofino Moonphase (Image: IWC). Measuring in at a whopping 45mm, the Portofino Hand-Wound Moonphase is certainly at the larger end of the scale, as far as dress watches are concerned. It borrows its hefty dimensions from the original Portofino from 1984, which was designed as a homage to classic pocket watches. The extra size also allows room for a mainspring barrel big enough to grant the watch its extraordinary 192 hour (or eight day) power reserve. Driven by the in-house Cal. 59800, from the 50000 range that was first introduced in 2015, the Portofino’s moonphase display is so accurate it needs adjustment by just a single day every 577.5 years – so make yourself a note somewhere. The watch itself is part of a collection of five, made up of two standard-issue pieces with either red gold cases and slate grey dials, or with stainless steel cases and silver faces. Additionally, there are three special edition models – two in steel and one in red gold – which are known as the ‘150 Years Limited Editions’ (150 examples of each are up for grabs). 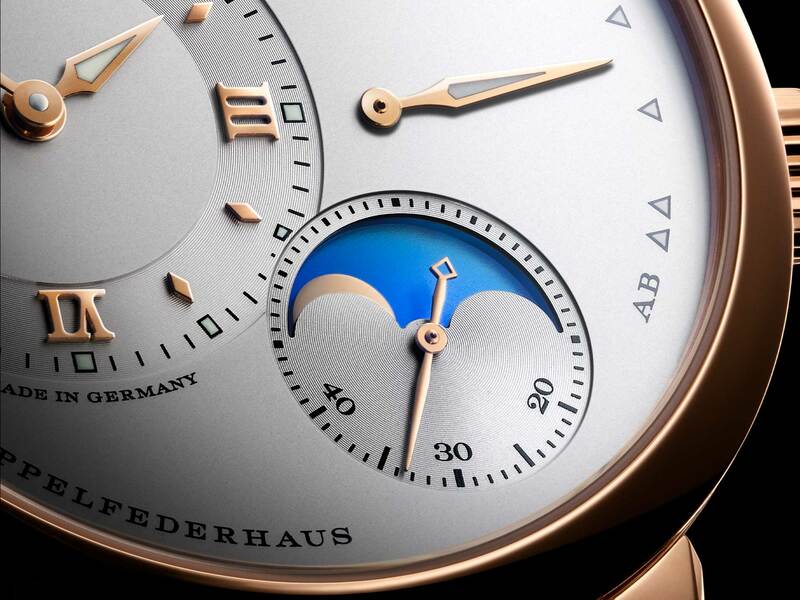 The styling follows the same ethos as the rest of the Portofino family, prizing elegant legibility above all else; a hacking seconds sub dial at the six o’clock, small date display at the three, a power reserve indicator at the nine, leaving the 12 o’clock free for the beautiful golden moon on its midnight blue background. It is a lot to cram onto one dial, but there is plenty of real estate available to allow room for everything. Each variant is fitted with the Portofino range’s customary leaf-shaped hands (four in total), which are an especially graceful and understated design. Hour indexes are simple applied batons, cutting down on the possible dial clutter that sometimes accompanies the use of Arabic or Roman numerals. Turning it over, a display caseback gives a view of the somewhat modest finishing on the movement, with Côtes de Genève striping and a spot of circular graining, or perlage, on the bridges and plates. In all, the IWC Portofino Hand-Wound Moonphase packs a great deal of charm into its tasteful shell, making it a watch that looks good from any angle, and with any outfit. 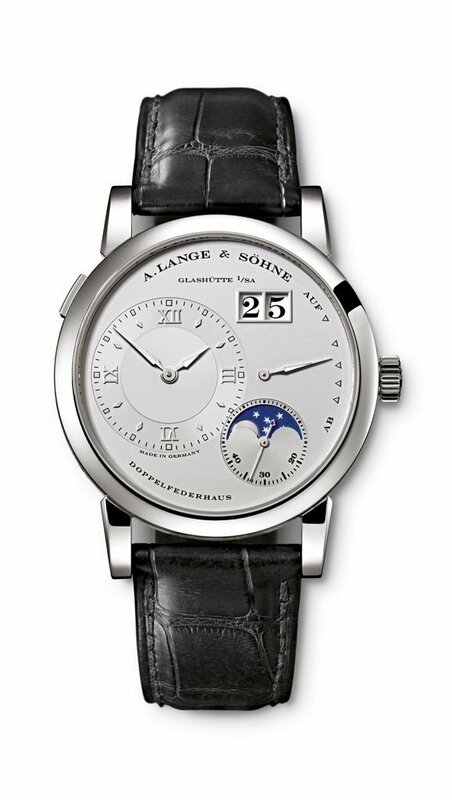 A. Lange & Söhne Lange 1 Moon Phase (Image: A. Lange & Söhne). Arguably one of the kings of the moonphase watch, Lange’s portfolio currently contains 16 models that feature the complication. Among those, the Lange 1 collection accounts for three; one in pink gold, one in white gold, and the third in platinum. The range was granted a movement upgrade in 2016, along with an incredible new moonphase display which also doubles as a day and night indicator. Comprising of two discs, one stacked on top of the other, the upper lunar disc operates as a standard moonphase display, which is accurate to one day every 122.6 years. Below and behind that, a second disc rotates once every 24 hours, forming a backdrop to the moon’s orbit, with the different times of day represented by a graduated range of blues. Morning and afternoon are shown in a bright sky blue; however as the sun goes down, the background subtly shifts much darker and richer, and 383 golden laser-etched stars appear. The engine powering it all is Lange’s new L121.3 movement, which brings their in-house moonphase movements up to around 20. Manually-wound, with a 72 hour reserve, the 47 jewel mechanism is comprised of some 438 parts. Out front, the styling follows the same blueprint as the original Lange series, with the moon disc taking the place of the small seconds counter at the five o’clock position. The brand’s signature oversized date is present and correct, and doesn’t unbalance the design of the dial at all – even on a relatively small watch such as this, which comes in at just 38.5mm in diameter. The actual time is displayed on a large off-centered sub-dial, with applied Roman numeral indexes and gold alpha hands; additionally, there is a similarly styled pointer for the power reserve indicator. The three models in the range all have their own distinct personalities. The pink gold with brown leather strap and silvery (argenté) dial has a real warmth to it, while the white gold piece is given a stronger, more monochrome look with its black dial and strap. Also fitted with a black leather band, the platinum model is possibly the most understated, with rhodium silver used for both the dial and the hands for minimum contrast. It is also the most pricey option, costing somewhere in the region of $52,000. The gold versions are both priced around $40,000. 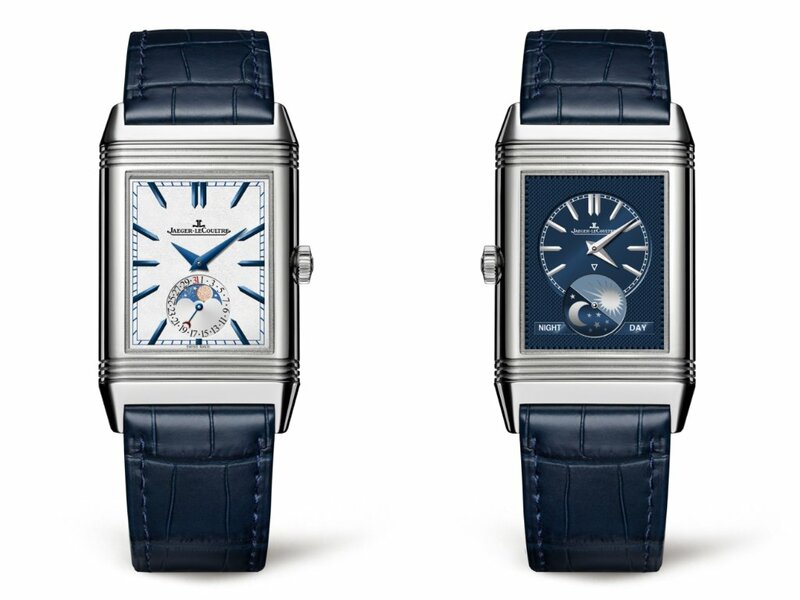 Jaeger-LeCoultre Reverso Tribute Moon (Image: Jaeger-LeCoultre). 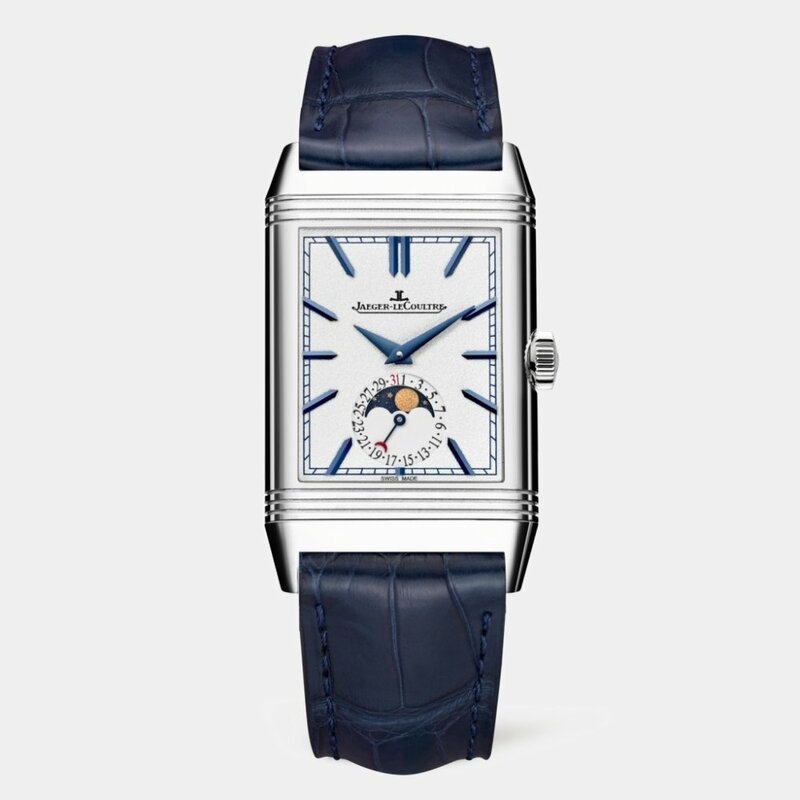 JLC’s Reverso needs no introduction. Since it first made its appearance way back in 1931, the Reverso is one of the most innovative watch designs ever made, and has been such a successful venture that there are now an almost uncountable number of variations in existence. This latest piece is a continuation of the ‘Tribute’ series that Jaeger-LeCoultre started in 2011 to commemorate the 80th anniversary of the original model. The Tribute Moon is actually from 2017 and stands as a watered-down version of the hyper-complicated Tribute Calendar from the year before. The stainless steel case contains the in-house manufactured Cal. 853A movement, which drives each of the Reverso’s pair of dials, along with its date display, day and night indicator, and (of course) the moonphase complication – all while managing a 42-hour power reserve. The two faces give the watch a dual personality. The front side is textured with an exquisite silver grain and accented by contrasting hour markers and dauphine hands. At the six o’clock, the moonphase and date indicators share the same circular aperture – a golden moon and stars in the middle, and the days of the month around the outside. A small hand with a red crescent tip points out the correct date around the periphery. Like other Reverso watches, the dial can be reversed, which settles into place with a satisfying mechanical click. The reverse dial is a beautiful blue color, with a Clous de Paris finish and a silvered handset. The two-tone night/day disc sits at the bottom, helping wearers distinguish between AM and PM for the second time zone. It may well be a member of one of the most iconic watch families of all time, but at around $12,000, Jaeger-LeCoultre proves the price of a moonphase watch doesn’t have to be astronomical (ha!). Like other Reverso watches, the Jaeger-LeCoultre Reverso Tribute Moon is like having two watches in one (Image: Jaeger-LeCoultre). Moonphase watches have always been more about aesthetic display than any real world use. However, it is hard to argue against their visual appeal – or the sheer virtuosity of the watchmaker’s art behind them. Can any serious watch collection be called complete without at least one? Tell us what you think in the comments below.